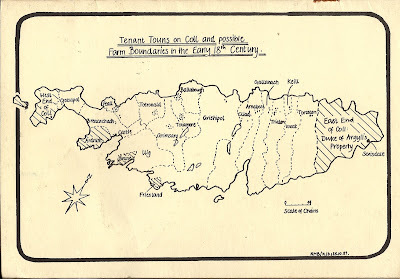 This map is very helpful for locations; Nicholas Maclean-Bristol, The Isle of Coll in 1716, outside back cover. 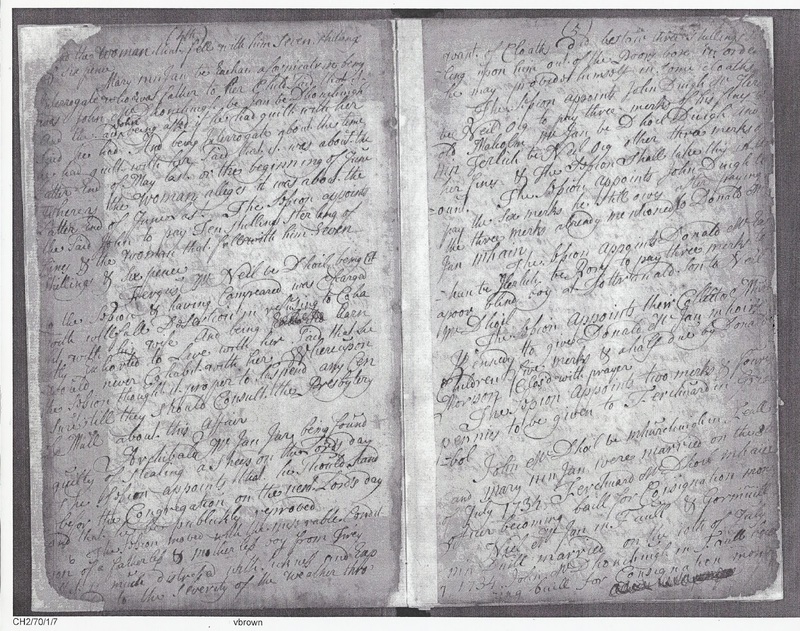 ▪ The register for Coll kirk sessions minutes was digitized in folio layout (facing pages). The entries appear on hand-numbered pages 1-10, each entry often beginning or ending mid-page. 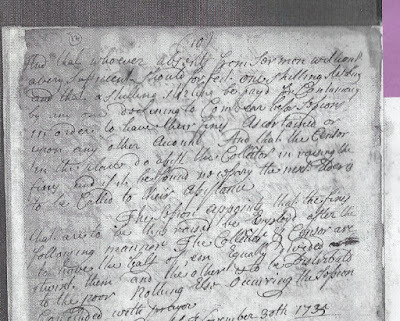 Page 11 is blank after the last (1735) entry of this period. ▪ Entries resume on page 12 with the date 30 May 1775 and the 1776 entries begin on page 13. 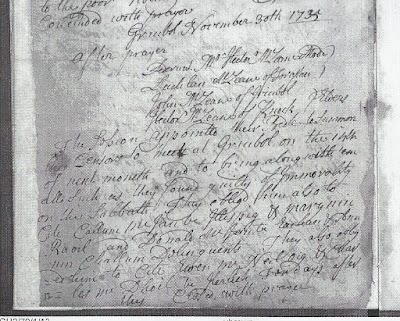 The (catechist's) list of Coll inhabitants begins on page 29 (2 December 1776). ▪ It is unknown why the November 1735 entry follows the entry of December 1735. It may indicate the clerk was accustomed to taking loose notes at the session meetings and later transferred them into the register. ▪ Mr. William Morisson who moderated the first two sessions was the Coll and Tiree parish minister living on Tiree. The assistant minister residing on Coll was Mr. Hector McLean (moderator of most meetings). He lived in a house at Cliad where a room was used for Sabbath worship. He was a distant relative of the same-named Laird. ▪ Since Mr. Hector stayed on as assistant minister until he died in 1775, no doubt the kirk sessions continued during the intervening years 1736-1775. But whether meeting minutes were written as loose paper notes or a kept in a separate register, they have not been located. In one set of minutes the latter two men were called "Sessioners." I am unable to find a distinction between elders and sessioners. 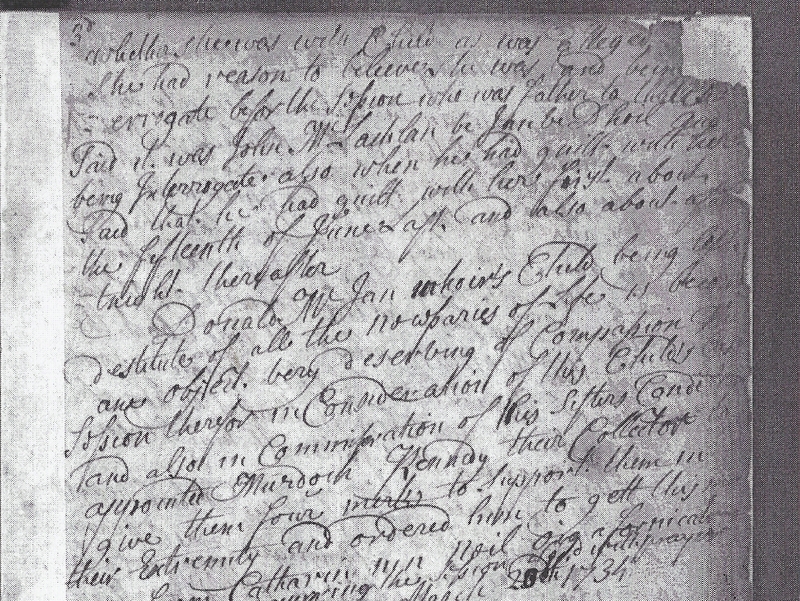 ▪ Local kirk officials mentioned in the minutes were treasurer, collector, censor, and beadle. Unspoken was the session clerk who actually recorded the minutes. We are seldom told who filled those positions from time to time but Donald [---] was appointed treasurer in 1732 and Murdoch Kennedy was the collector in 1733. ▪ Punctuation in the minutes was obviously not an important issue. Spellings of personal and place names vary but are generally recognizable. The use of capital letters for many words is erratic, perhaps largely due to my lack of distinguishing them. ▪ Now having more familiarity with the handwriting and syntax, I will be reviewing the transcriptions with an eye to possibly filling in some missing words. ▪ The Kirk Session was the local court for religious observance and social conscience. Ranking high among immorality offences was breach of the Lord's Day by failing to attend the service. The Elders followed a protocol for all transgressions in a system of rebukes, censures, and so on. Serious cases, including repeat offenders, would be referred to the Presbytery of Mull. ▪ More than a generation, forty years, lapsed in the missing period between 1735 and 1775 which is frustrating for family historians, especially those who can identify names in the minutes. 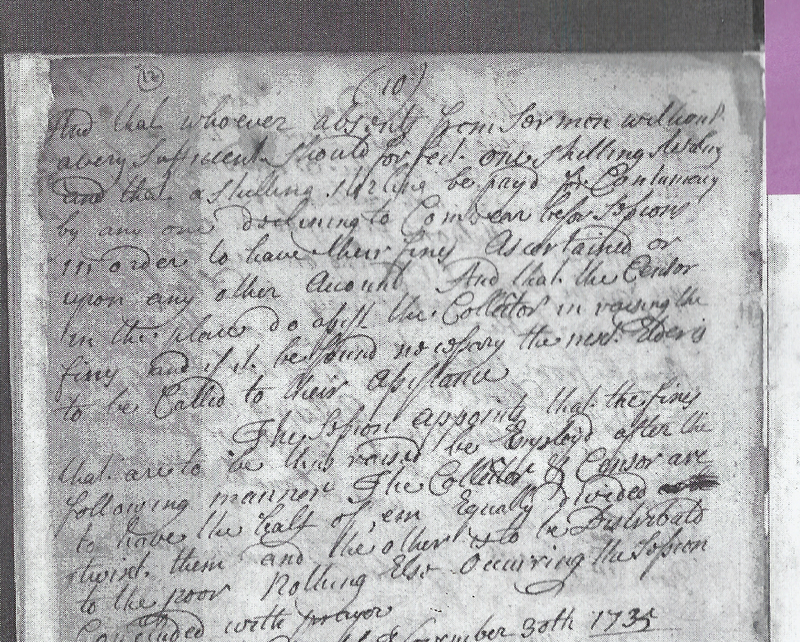 The adults named here may or may not have lived until the 1776 list of Coll inhabitants was made. ▪ Connecting people of patronymics with the family surnames that were evolving takes special skill. It was suggested as an example that McIan was the precursor of what we know as the Johnston surname on Coll. Please add (in the comments) your own interpretation or guesses ― Dhoil? McDonchaig? McMurchuig? McIllhalum? and etc! Anyone ― what is the significance of the often-inserted Gaelic "oig" (og) after some names? ▪ Who can solve the mystery of what the [black]smith was making for the community? It's likely an archaic word now. "Toggs"? Something for fishing or agricultural or livestock use? Or a necessary cooking tool? An item belonging to clothing, such as something for shoes? ▪ I take full responsibility for errors and misinterpretations herein. All corrections and comments are welcome! Nicholas Maclean-Bristol. 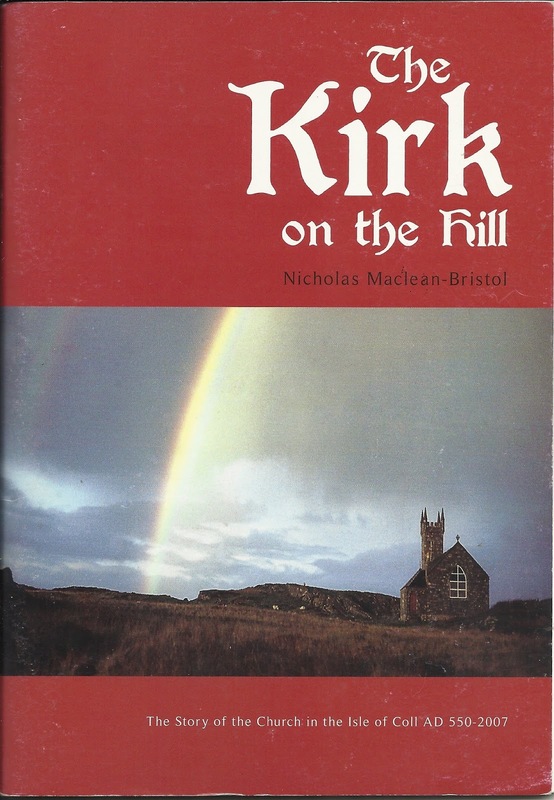 The Kirk on the Hill: The story of the church in the Isle of Coll AD 550-2007. Coll, Scotland: The Society of West Highland and Island Historical Research, 2007. Nicholas Maclean-Bristol. The Isle of Coll in 1716. Coll, Scotland: The Project Trust, 1989. 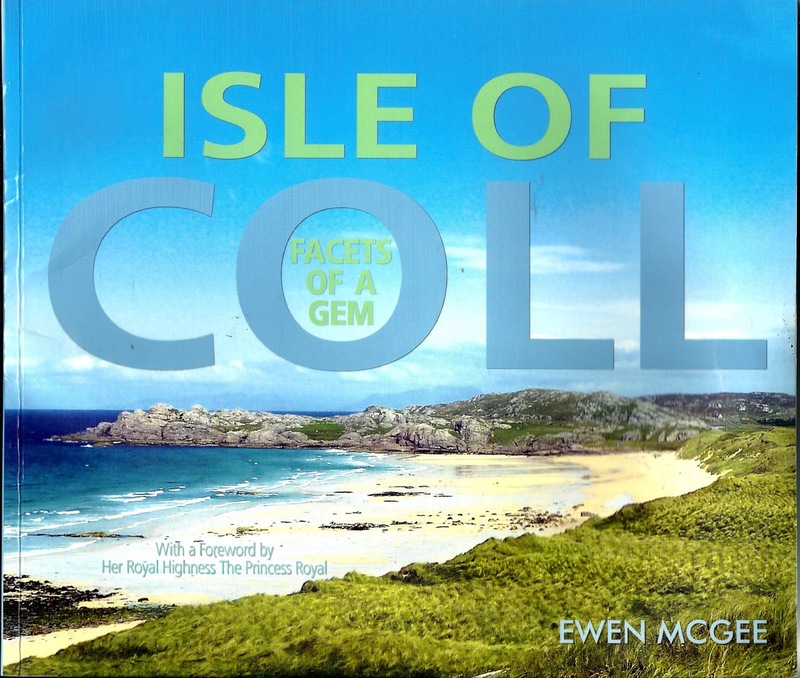 Ewen McGee, Isle of Coll: Facets of a gem. UK: Islands Book Trust, 2015. ▪ It is unknown why this November entry follows the previous entry of December. It may indicate the clerk was accustomed to taking loose notes at the session meetings and then transferring them into the register. 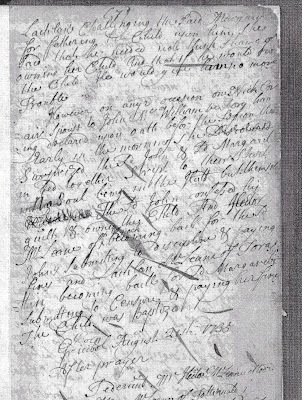 ▪ This is the last entry of session minutes until the same register resumes 30th of May 1775. ▪ One final post will follow soon to summarize some of the salient points. ▪ Contumacy - willful, stubborn non-compliance when summoned. 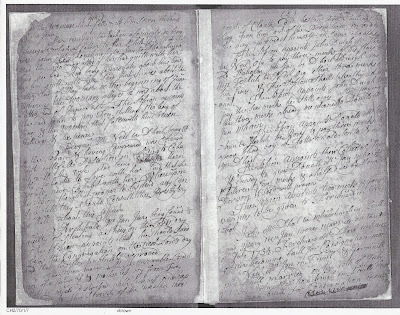 ▪ Reminder: the first transcription has an introduction (click link to see it). ▪ This session meeting was the first in 1735, over a year after the previous meeting. ▪ In the lists of names, sometimes there are commas, sometimes not. I've added semi-colons to separate the different farms/touns where miscreants are named, but see below the transcript for a re-sorted list. ▪ "Each End" below refers to the Two Ends of Coll that were in Campbell tenure. ▪ Click on illustrations to enlarge. ▪ There is no usual sign-off "with prayer." ▪ Pen scratches or splashes occur on the one page. ▪ This is the first entry for 1734. ▪ It covers two and a half pages in the register, the longest entry. ▪ It ended as usual "with prayer" but the clerk added one more item of assistance and two marriages that occurred months later. 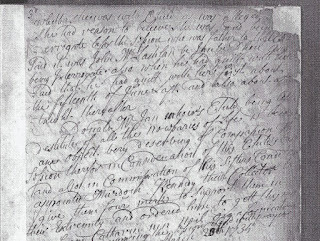 ▪ "Bail for consignation" money was a deposit made by a relative or friend (sometimes called a cautioner) to the kirk session to ensure that the marriage would take place within a certain time period and the couple would observe chastity until then. The custom was not consistent within the church or across the country. 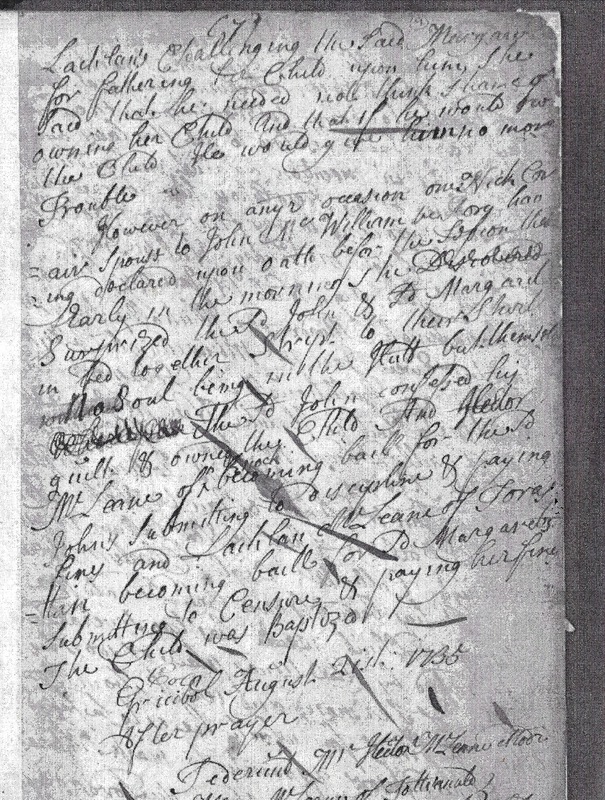 In this case, the money might have been received in March and the clerk was obliged to record later that the events did take place. Canadian family historians may be more familiar with the similar "posting a bond" to ensure the intentions of the proposed marriage. 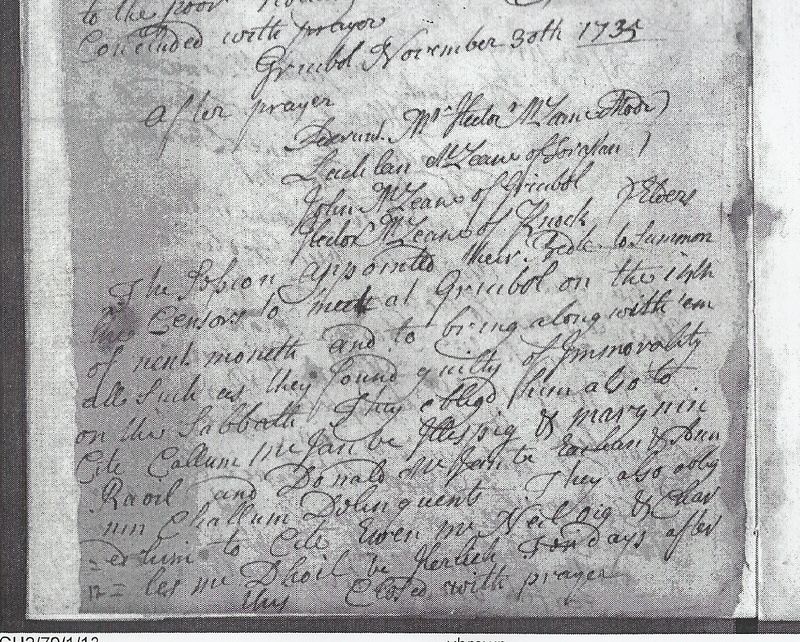 September 1733 (part 4), August 1733 (part 3), February 1733 (part 2), and 1732 (part 1). ▪ The date here is incomplete, as if the recording clerk forgot to go back and insert the day and month. ▪ Note the system of distributing cash, from the sinners to the deserving.